"Suppose, right, your father in jail. How do you feel? My father, he shot my mother...in the leg. It's sad that somebody else gotta take care of me and my father can't, because he's in prison." The Boys of Baraka is a call for both celebration and outrage. Directors Heidi Ewing and Rachel Grady follow a group of young black boys from Baltimore who are handpicked to spend two years at the Baraka School in East Kenya. The idea behind selecting these 20 "at risk" boys is to remove them from a destructive environment and allow them an opportunity to get into any high school of their choosing. According to the Baraka School's plan, this will help each young man to succeed and rise out of urban hell. The documentary follows a handful of these boys who certainly need more assistance than a guidance counselor can provide. Devon Brown is a talented, intelligent boy who is raised by his grandmother, Mary, because his mother is a hopeless drug addict. He dreams of being a pastor and in some candid scenes of him at church we can easily see him being an effective leader at just about any congregation. Richard Keyser, Jr. is a charismatic lad who loves to play to the camera, but comes from a fractured family. His father is in prison after attempting to kill Richard's mother. Accompanied with little brother Romesh, Richard seems an ideal candidate for the Baraka School. Without this opportunity, one can easily see this child falling into the world of drugs he so clearly laments. Concluding the principal figures in the movie is Montrey Moore. Of all the boys heading to East Kenya, Montrey seems to be the most in need of assistance. Prone to violent outbursts, he appears to be lacking any direction in life, and when his mom mentions seeing a killing while driving home, one can easily imagine Montrey being the victim someday. Well, I'm not going to say. 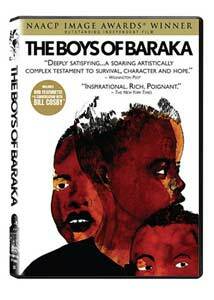 The Boys of Baraka is not an against-all-odds, everything-will-work-out story. There are successes and failures at the Baraka School and back home in Baltimore, for a variety of reasons that play out in unexpected ways. The filmmakers have captured a vivid portrait of life for inner-city families. Stripped of pretense and soapboxes, the movie gives us a bird's-eye view of its recorded events. Watching Devon, Richard, and Montrey at this critical point in their lives, I wanted to stand up and cheer them on. Sadly, the constraints of cinema don't allow for it in this case. The boys are all but powerless, as is the audience, to sway the tides that help some to succeed and push others out to sea, where they may very well drown. I suppose that's where the outrage comes from that I mentioned at the beginning of this review. The celebration comes from seeing the men and women work at the Baraka School. With tireless effort and absolute conviction, they've devised a plan to help children succeed. Is it a perfect system that guarantees success? No, but it's taken these young "at risk" boys from Baltimore and made some of them into promising men with the world open to them. It might not be much, but it's a start. Image Transfer Review: The 1.33:1 transfer is nothing special to look at. Preserving the original aspect ratio, the picture here accurately reflects the source material. The digital video looks quite flat and uninspiring, which means that this is not a disc to demo your home theater setup. Nor is it meant to be. Audio Transfer Review: The Dolby Stereo 2.0 English mix is nothing exceptional, either. Everything sounds fairly crisp, especially considering it's raw audio from the shoot. For scenes where the boys' dialect is difficult to discern, the documentary thankfully adds subtitles. Even when played in ProLogic, things is still quite front heavy. However, the by-the-numbers audio track suits the material well. A Conversation with Bill Cosby—a video interview with comedian Bill Cosby, discussing his reaction to the documentary. Extras Review: ThinkFilm provides a nice bit of supplemental material for this release. Prior to the main menu, the trailers for The Untold Story of Emmett Louis Till and Born Into Brothels are shown in widescreen and Dolby Stereo sound. A feature-length commentary with directors Heidi Ewing and Rachel Grady offers some nice insight into the making of the documentary. Some of their observations are pedantic, but they offer some nice input about the children and their interactions with one another. After that is The Boys: An Update. Much like the cast and crew biographies you find on other DVDS, this presents text cards about Devon, Richard, Montrey, and Romesh. Although quite brief, it is good to get a bit of information concerning their current situation. In A Conversation with Bill Cosby (06m:37s), Cosby explains how his childhood paralleled the situation shown in the movie and offers his opinions on what these boys need to succeed. Six deleted scenes are also available and can be played either individually or all together (with a combined runtime of 17m:33s). While not essential to the narrative, these are a wonderful supplement and allow greater access into the unique personality of each boy. The Boys of Baraka trailer rounds out the special features. While not the most amazing collection of special features, the material here is a welcomed inclusion on the DVD. The Boys of Baraka is a compelling documentary that examines a unique solution to solving the problems facing inner-city youths and merits a viewing.